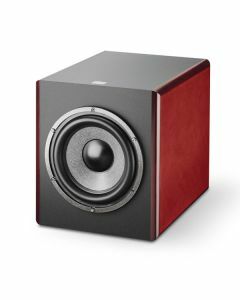 The Sub6 is a large volume cabinet design, equipped with an 11" woofer and a rear laminar port. This configuration guarantees bass linearity whatever the intended SPL. The control board is extremely versatile, with connectivity which allows a 2.1, 2.2 and multichannel use via the L/R inputs and outputs and the LFE. The Focal Sub6 is a high volume cabinet design, armed with an 11" woofer and rear laminar port. This configuration ensures bass linearity regardless of intended SPL. The control board is exceptionally adaptable, with connectivity which permits a 2.1, 2.2 and multichannel use via the L/R inputs and outputs and the LFE. The Sub6’s numerous settings, like the high-pass crossover devoted to monitors, the adjustable phase and level control, deliver optimum coupling when combined with Solo6 Be or Twin6 Be monitors. The footswitch input means that the user is able to connect a pedal to deactivate the subwoofer, and the high-pass crossovers on the outputs, that supply the monitors. This streamlines and significantly improves control during the different stages of monitoring. The Sub6 also capitalises on Focal's "W" composite sandwich cone. The inimitable characteristics of the cone permit optimisation of the frequency response curve, thanks to the total control of three key parameters: lightness, rigidity, and damping. The sound is breathtakingly transparent, has an excellent phase response and an extremely low distortion rate. Connection: Right, left, LFE, XLR 3 points socket. Connector: XLR 3 points plug. â€¨LFE + mono low-passâ€¨24dB octaveâ€¨. Switch high-pass filter, cut-off frequency selection. Speaker section : 24 dB / octave. Connection: Removable IEC supply wire. 2.1 "Bypass" (external remote contol).